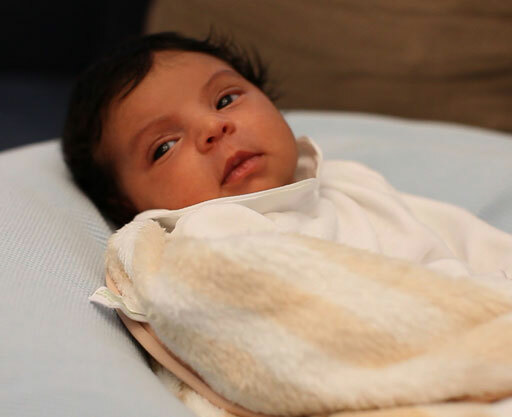 Blue Ivy Carter (2012) is the daughter of Beyoncé and Jay-Z. Two days after her birth Jay-Z released the song ‘Glory’ on his website lifeandtimes.com, dedicated to his newborn daughter. The song is about the pregnancy struggles of Beyoncé and Jay-Z, including a miscarriage Beyoncé suffered before becoming pregnant of Blue Ivy. At the end of the song Blue Ivy's cries are included, she was officially credited as B.I.C.. When ‘Glory’ debuted on Hot R&B/Hip-Hop Songs at number 74, at only two days old, B.I.C. became the youngest person ever to appear on a Billboard chart. Furthermore Blue Ivy was famous long before she her birth: Beyoncé’s pregnancy announcement during the 2011 MTV Video Music Awards was listed in Guinness World Records for most tweets on Twitter per second recorded for a single event (at 8868 tweets per second) and ‘Beyoncé pregnant’ was the most Googled term in the week of August 29 2011. Her parents unsuccessfully attempted to trademark her name to start a line of merchandise. See also Jay-Z and Beyoncé.